This recipe for Gingery Rice Noodle and Greens is a bit of a teaser to spring. It’s light and full of refreshing flavours such as leafy greens, cucumber, and mint. I’m currently visiting my in-laws in Florida and later this month travelling to Maui. I guess my excitement to escape the snow is reflected in this salad. There is a produce stand at the Union Square Green Market called Windfall Farms and they sell an array of beautiful, flavourful lettuce and micro-greens. I can never resist going in there and seeing what’s new. They let you sample everything before purchasing which really opens your eyes up to lettuce, a category I once took for granted. I find it amazing how one little leaf can be packed with so much flavour. In this salad I used Windfall’s spring mix, which includes arugula, tatsoi, red oak, mâche, baby beet greens, and mustard leaves. I also topped off the salad with purple radish sprouts. You don’t need to head to a farmers market to find beautiful greens, you can also head over to your supermarket. I’m finding that supermarkets are starting to offer more interesting lettuce in their mixes. I now like to read what the blends are made of to educate myself. This salad is a great option to serve instead of just a lettuce salad because it’s light and everyone loves noodles. I use brown rice vermicelli noodles because they are a bit more nutritious than white. However, I do find the white rice noodles have more stretch and a better elastic texture. So decide for yourself what you prefer. You can find vermicelli noodles in most grocery stores, usually in the Asian sections next to the soy sauce. It doesn’t matter if they are Chinese, Vietnamese, or Thai just look for thin or medium thickness. With a mandoline or knife, slice the cucumbers almost paper thin. In a bowl, mix together the cucumber and remaining ingredients. Allow to marinate in the fridge for at least 10 minutes. Cook the noodles according to package instructions. Rinse under cold water and drain well. In a medium bowl, toss the lettuce with enough dressing to lightly coat. In a large bowl, combine the noodles, cucumber, mint, and green onions and toss with remaining dressing. 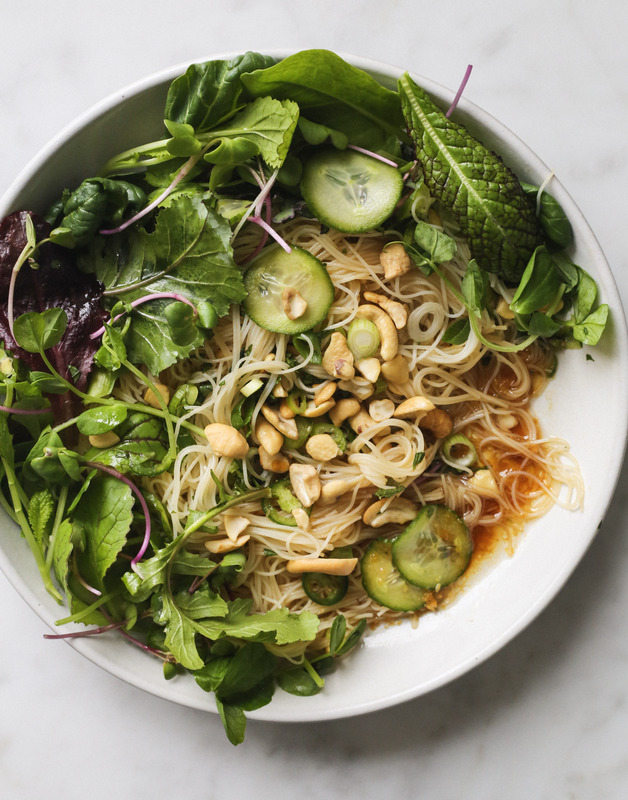 Transfer the noodles to a serving bowl and top with lettuce, toasted cashews and sprouts. Serve immediately. * Toasted Cashews: Preheat oven to 350°F. Place your nuts on a baking sheet and bake for 5-10 minutes, until golden and fragrant. This entry was posted in Salads and tagged asian, brown rice noodles, ginger, gluten-free, light, refreshing, rice noodles, salad, spring, summer, Vegan. Bookmark the permalink.